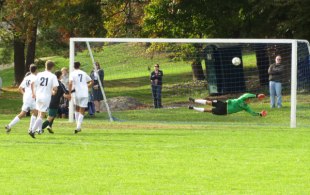 Photo: La Salle’s goalkeeper tries to keep out Jake Saba’s restart goal for Landsdale Catholic. You could hear the ping of the back post 100 yards away. The Catholic League semifinals take place on Saturday with Landsdale Catholic against Roman Catholic, and on Tuesday with Archbishop Ryan against Father Judge. Tuesday’s Public League final features Central against Northeast. Here’s a recap of playoff games that got the teams there. First place Father Judge faced Bon­ner-Pren­der­gast on Monday, Oct. 21, winning with a comfortable 3-0 scoreline. On Tuesday evening, Ryan found an overtime goal courtesy of a breakaway from Joe Stock to win 2-1 against second place St. Joe’s Prep. The Northeast Times Times has a nice write up of Ryan’s season, including the upset playoff win. Third place Roman fought it out with sixth place Wood, winning 1-0 in overtime. Here is a Roman season write up from Ed Morrone. Six days after losing to La Salle in the last game of the regular season, Lansdale Catholic defeated the Explorers 3-1 to advance to a semifinal meeting with Roman Catholic at 1 pm on Saturday at Archbishop Ryan. The Public League Quarterfinals took place on Tuesday, Oct. 22. First place Northeast beat eighth place FTC 3-1, pulling away in the second half. Sophomore Adin Hernandez-Carrera stepped up and scored a hat trick to put Northeast in the finals. South lost to Philadelphia Area Charter School, conceding two PKs and only finding one goal in response. Seventh place South made it a close game, but in the end second seed PACHS, true to form, found the 2-1 victory. Third place Central played against sixth place Fels. The first half was a back and forth affair, with numerous opportunities on both ends of the field. Fels could not get the ball past Central keeper Greg Winter, who would end the game with 13 saves. Central mid Nico Heredia nodded a throw-in on to senior Jake Dillon, who deftly finished with a half volley. The second half was more one sided, with Fels only making a few forays out of their half, and Central was able to nod in a corner to cement the 2-0 win. Fourth place Washington faced fifth place Prep Charter. At full time the game was 2-2. Washington lost 3-2 in overtime, when Prep player Mohamed Kamara got a break away and finished the ball. On Thursday the Public League semis took place. In the first game, first place Northeast took on fifth place Prep Charter. Northeast buried the game in the first half, finishing five goals. In the second half both teams scored once for a final score line of 6-1. The second semi-final took place immediately after, with second place PACHS taking on Central. While Central was able to dominate proceedings, it took thirty seven minutes for them to score, when Jason Pixley played an artful ball that Jake Dillon settled and finished to the far post. In the second half PACHS earned a penalty two minutes in, and buried it. Central regained the lead about two minutes later, when a shot pinged off the post, and fell to junior center back Jakub Zegar who blasted home from short range. Central was able to hold the lead. Central will play Northeast for the Public League title at 5 pm on Tuesday, Oct. 29, at Northeast SuperSite. Thanks for doing this Josh!!!!!!! !